Mullahs’ judiciary chief: Who is [the UN] Secretary-General to tell us stop the executions; these words are cheap, baseless and lack reasoning. Executions for corruption on earth is an internal matter. On Thursday, September 17, 2014, at least 17 prisoners were hanged in cities across Iran, including five in public. 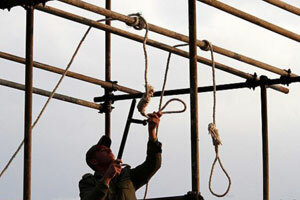 The executions were carried out in cities of Shiraz, Marvdasht, Kerman and Bandar Abbas. A group of four prisoners were hanged in public in Shiraz while another group of eight sent to gallows in Shabab Prison in city of Kerman. The Thursday’s executions followed reports of more executions that had been carried out in other cities in Iran. A group of seven young men, mostly in their 20s, were executed on September 10 in cities of Karaj and Hamadan. Prior to that, 15 prisoners were hanged on September 1 in Karaj’s Ghezel Hessar Prison and in prisons in cities of Hamadan and Zahedan. Ten of those hanged were prisoners who had been protesting in Ghezel Hessar Prison. Thirteen other prisoners were hanged on August 26 and 28 in groups of 8 and 5 in the main prison in city of Bandar Abbas. The inaction by the international community, particularly the Western countries, regarding crimes committed by the clerical regime, including over 1,000 executions since Hassan Rouhani assumed office, has emboldened the clerical regime to continue and ramp up torture, execution and suppression. Iran’s human rights dossier should be referred to the United Nations Security Council. This is not only an essential step to stop the cycle of crime and execution, but it is necessary for adherence to the values that the United Nations has been established to defend.